The Adventures of a Far Away Bear, featuring B B Bear and his trusty sidekick Dusty, is a delightful read for all ages ... for children following the journey B B and Dusty take trying to catch up the B B's Uncle Willy as they tour around England, Scotland, Wales and Ireland, for adults to enjoy the lark and the incredibly gorgeous scenery. Each book is filled with the brilliant photography of June Earle as she silently follows B B and Dusty on each fantastic stage of their adventure. All books are available on Amazon as well as through Linellen Press. 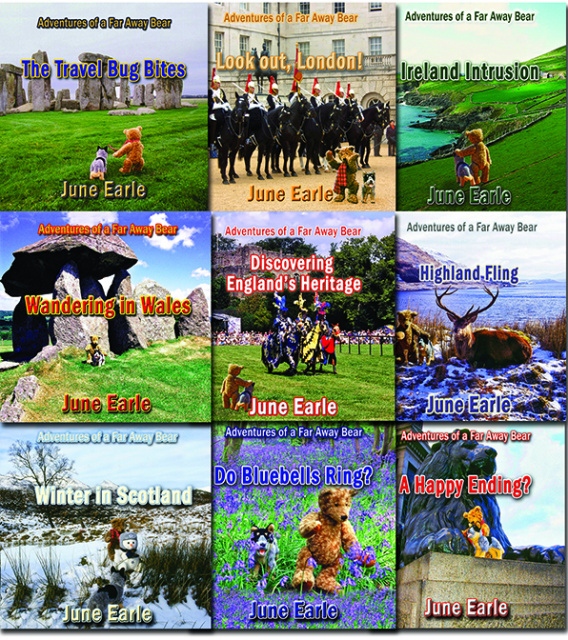 To order through Amazon, go to https://www.amazon.com/books-used-books-textbooks/b?ie=UTF8&node=283155 Type 'June Earle' into the search bar.